Cressington Parks is a 19th Century gated private estate built for wealthy merchants who needed easy access to the city of Liverpool. Cressington has been designated a conservation area with many examples of period street furniture including gas lamps, gates and railings along with all the period buildings. In fact, the streets have been used for many television and film sets. 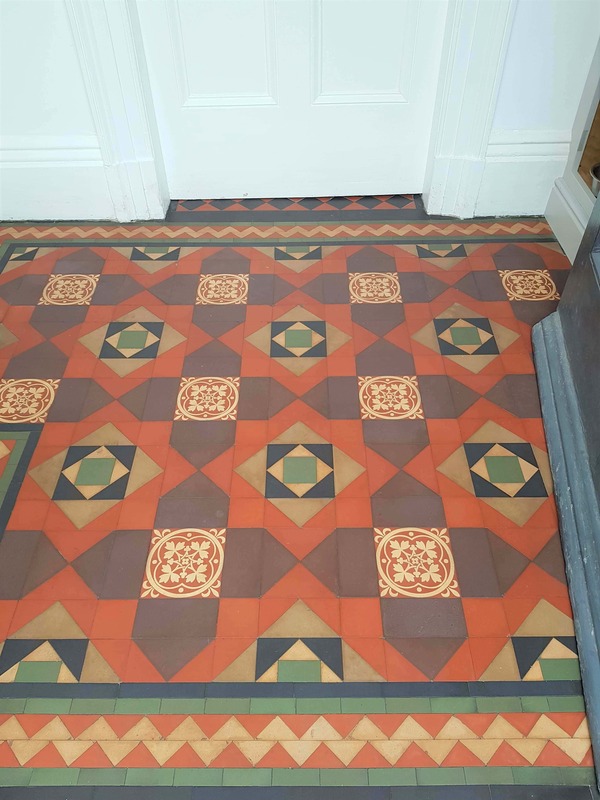 As you can see from the picture below this small but impressively intricate Victorian Tiled floor was in need of some love and care after being covered in carpet for many years and we were asked to do the renovation. We have restored several period floors in the conversation area where we find the properties are popular with younger family’s buying the homes for restoration. This particular floor was at the servants’ entrance to the main house and required deep cleaning and a few repairs to be carried out. Given the small size of the floor we were aiming to complete the job within a day by using low moisture cleaning techniques. The first task was to remove as much of the old coatings which included carpet glue, paint and varnish using very sharp scrapers. Once this was done, we covered the floor with Tile Doctor Acid Gel. Being in gel form it’s very easy to control and means it will stay in in place where a liquid treatment would just run away. After leaving the gel to dwell for ten minutes, we used a slow speed buffing machine fitted with extra weight and a black scrubbing pad to work the product into the tiles. This now soiled gel was then rinsed off with a little water and extracted using a wet vacuum. When we use this cleaning method the acid gel cleans the floor and helps counter alkaline salts inherent in the floor. Whilst the floor was drying, we turned our attention to the damaged tiles which we replaced with matching tiles that we had sourced earlier. It takes some time to do this as you need to scrape out the surrounding grout, lever out the broken tile and then scrape out the adhesive. The new tile is then set in place with rapid set adhesive and matching grout. Once that had set the rest of the floor was encouraged to dry out faster with the use of heat guns for about twenty minutes before letting the floor cool down. At this stage the floor was looking much improved! After a further twenty minutes we did a damp test using a damp meter to make sure the floor was ready for sealing. The minimal use of liquids and added heat had worked well and we were able to move on and seal the tiles starting with a single coat of Tile Doctor Colour Grow which is an impregnating fully breathable sealer that brings out the colour in the tile. The first coat was left to dry for forty minutes before following with three coats of Tile Doctor Seal and Go Extra. This is also a breathable sealer and is ideal for situations where no damp proof membrane. The Sealer left the floor with a lovely sheen and the colourful tiles really shone through. The floor was back to its’ former glory. Our customer was over the moon and has asked us if we could return to restore the outside pathways, what better feedback can you get. 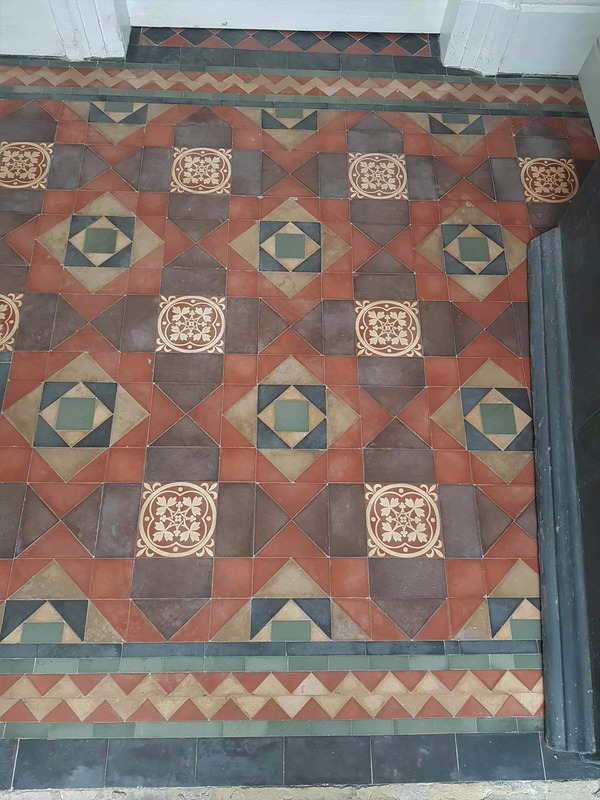 This entry was posted in Victorian Posts and tagged Cressington, deep cleaning, Liverpool, Porch Tile Restoration, Restoring Tiles, Tile Replacement, Victorian Tiled Porch, west cheshire by AbzDominise. Bookmark the permalink. Tile Doctor have a range of sealers that cover all types of finish and situations, before having your Victorian floor tiles sealed make sure you choose the sealer that is right for your requirements.